All of my friends and family know that I don’t really enjoy baking. I usually end up with store-bought goodies or ask for help. This is exactly what happened for my Galentine’s Lunch – I enlisted the help of one of my best friends, Katie, who is an amazing baker, to step in and make something sweet. She delivered big time with these darling Buttery Spritz Cookies. 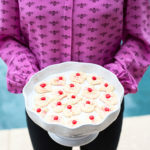 This recipe was her mother’s and she remembers making these with her, learning how to use a cookie press, to form these delicate treats. We added coarse pink sugar crystals and a cinnamon red hot candy to make it extra special for Valentine’s Day. You could absolutely change the sugar color and add another fun candy bit to customize these cookies for another holiday or event. 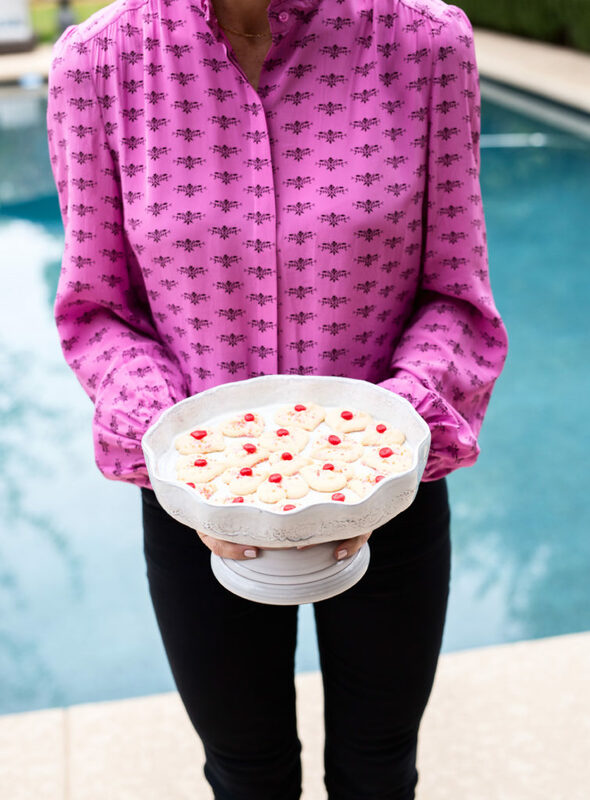 My friend Katie used a heart-shaped cookie press, but any cookie press will do – this recipe will work for any shape. It makes a lot too, so this would be a cute gift for any occassion, like a birthday, hostess gift or housewarming. Thank goodness I have great friends who I can rely on to bring that part of the meal or even for advice on how to make easy treats. 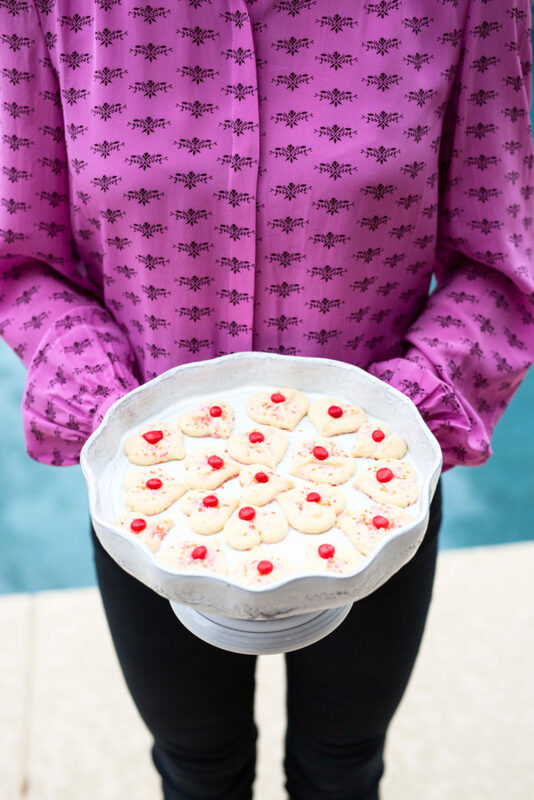 Just one layer cookies on this platter makes such a statement and the colors couldn’t have more perfect for my Galentine’s lunch. 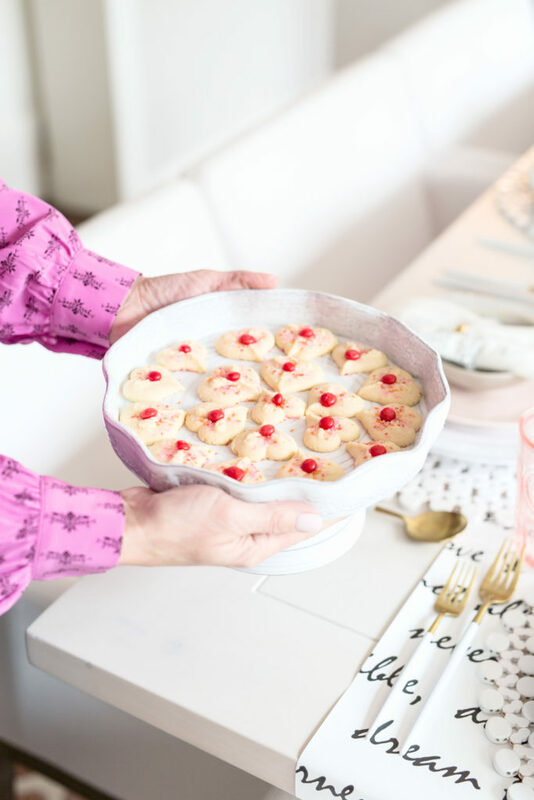 With the help of a decadent cookie press and little practice, you can whip a large quantity of these delicate buttery treats for gifts or entertaining with minimal effort. Combine the butter and sugar in a large mixing bowl. Using an electric mixer, beat on high speed until the mixture is pale and fluffy. Add the salt, egg and vanilla and beat until well combined. Using a wooden spoon or spatula, mix in the flour until thoroughly blended. Gently form the dough into a log shape. Following the manufacturer’s instructions, fill a cookie press with the dough (working in several batches) and dispense the cookies at least 1 inch apart onto ungreased baking sheets. Bake for 10 minutes, or until the cookies are lightly golden. Sprinkle with colored sugar, add red hot candy and cool on a wire rack. Can be stored at room temperature for 3 days or 1 month frozen. I loved using these for my Galentine’s lunch (see post here: https://tohavetohost.com/sweet-galentines-lunch/ ) because I didn’t want anything too heavy or too messy. These looked so pretty on a cake platter in a single layer so the delicate details from the cookie press were seen. They were small enough for everyone to grab a couple and place on their plate without taking up too much room. If you’re giving these as a gift, be sure to go the extra mile and wrap them in a clear bag with a pretty ribbon, or arrange them on a fun platter.